If discovering quality, unique craft beers and wine is at the top of your holiday ‘to do’ list, the Peel Region in Western Australia has you covered. Just one hour’s drive south from Western Australia’s capital city Perth, visitors to Mandurah and the Peel Region will find themselves spoilt for choice when it comes to boutique breweries and wineries, nestled in spectacular landscapes. The recently launched Peel Craft Beer and Wine Trail makes it even easier to leisurely make your way from place to place, with an easy to read and helpful map showing you the way. Featuring seven of the region’s best beer and wine offerings, the trail provides an authentically local experience. The easy to read map shows how to get from place to place, transport options available, food offerings and general information about the region. Three Rivers Brewing Company – a family owned urban brewery that uses only the finest ingredients and traditional brewing methods (no filtering pasteurization, or additives), offering great beer to take-away or enjoy in the tap room. 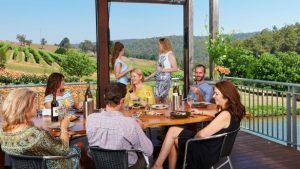 Peel Estate Wines – the largest and oldest winery in the Peel Region (est 1973), this magnificent vineyard is nestled between protected wetlands and tuart forest country. Producing an extensive range of quality red, white, rosé, sparkling and fortified wines available for tasting at the cellar door every day. Visitors are invited to bring a picnic or cook a bbq while enjoying the award-winning wines in beautiful country surrounds. White Lakes Brewing – a state-of-the art brewery, with an awarded range of brews, overlooking the beautiful Lake Walyungup. Enjoy a meal at the Vernon Arms tavern or while away a sunny afternoon on the Brewhouse deck. King Road Brewing Co – a proud family owned and operated brewery set on 90 acres of rural farmland, King Road Brewing Co offers a family friendly, vibrant atmosphere that optimises the area’s rural character and charm. It’s a location that provides freedom for the kids to run and play whilst you kick back, relax and enjoy the delicious food and beverages. Millbrook Winery – nestled deep in the forest, Millbrook Winery is simply breathtaking. Enjoy lunch in the award-winning restaurant or share a picnic hamper on the banks of the sparkling lake. Both are created using delicious estate-grown produce. Sample the range of Millbrook wines in the tasting room and discover why these highly-awarded wines have such a loyal following. Drakesbrook Fine Wines – a family owned and operated vineyard with a focus on premium quality, alternative and emerging varieties including Savagnin, Vermentino, Malbec, Sangiovese and Tempranillo to name a few. The cellar overlooks a magical landscaped lake where you are invited to bring your own picnic. The winery is consistently rated 4/5 stars by James Halliday in his annual Australian Wine Companion. Skipworth Wine Company – a multi award winning boutique winery, the vineyard is located on the edge of the Darling Scarp, offering picturesque views through the abundant Jarrah and Karri trees on the property across to the coast. Enjoy comprehensive wine tastings with winemaker/owner Kim Skipworth.